Triniti Malone (right) makes a point during the On Common Grounds event. In a darkened ballroom, journalist, scholar, and activist Marc Lamont Hill spoke of one of the Rev. Martin Luther King Jr.’s greatest strengths—the art of listening. 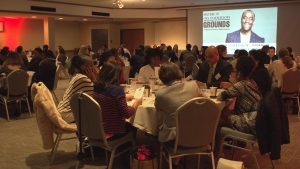 Conversations on diversity and inclusion are the focus of the program On Common Grounds, held after the Martin Luther King Jr. Cultural Dinner. On Common Grounds began in 2008 as a way to engage students and alumni in conversation about diversity and inclusion. 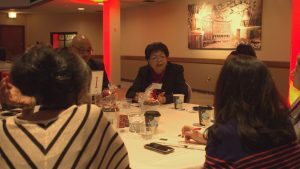 Facilitated by trained staff members, participants attend the annual Martin Luther King Jr. Dinner, then adjourn to a separate room to discuss the messages and issues surrounding the talk. Past speakers have included Angela Davis, Danny Glover, and Michelle Alexander. “This program offers students not only the chance to hear incredible speakers like Dr. Hill, but to come together and have a dialogue with people who span generations,” said Erin Thomas, who organized this year’s event with fellow members of the Division of Student Affairs, Judi Khalilallah, Anna Knepler, Donald Reed, and Debbie Ungson-Walbert. Alumna Camille Taylor joins the conversation during On Common Grounds after the Martin Luther King Jr. Cultural Dinner.